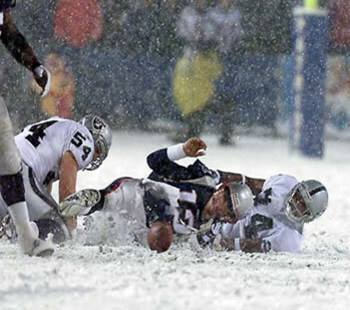 It has been 10 years since the Oakland Raiders and New England Patriots met in frigid Foxboro Stadium for an AFC Divisional Playoff game which has become to be known at the “Tuck Rule Game.” Images of that snowy night still haunt many a Raider fan, including myself. 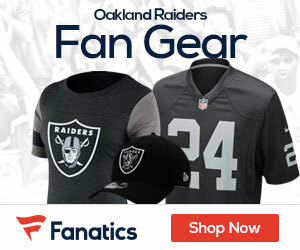 Although you may not need to relive the gory details, in the play, Raiders’ CB Charles Woodson got to and sacked Patriots’ QB Tom Brady, which in turn, seemed to caused a fumble that was recovered by Raiders’ LB Greg Biekert. Officials reviewed the play, and determined that Brady’s arm was moving forward, thus making it an incomplete pass. As a result, the original call was overturned, and the ball was given back to the Patriots, who then moved the ball into field goal range. With under a minute remaining in regulation, New England’s Adam Vinatieri kicked a 45-yard field goal to tie the game at 13, sending the game into a nail-biting overtime.. In overtime, Vinatieri kicked a 23-yard field goal to win the game for the Patriots, 16 to 13, crushing Oakland’s Super Bowl dreams that year. As you know, New England went on to beat the St Louis Rams 20-17 in SB 36.. That was probably the lst time the Raiders and Patriots have met in a meaningful game until now. “Different and improved..” Those are words that have been spoken many times since the Raiders last winning season of 2002, but without much backing. Even though it is only week 4 of the 2011 season, a victory Sunday against the Patriots would indeed go a long way into finally giving the saying “different and improved” some real meaning. Already a “big” game for both teams, Sundays match-up between Oakland and New England could go a long way into looking into the crystal ball for the rest of the 2011 season. “Different and improved.” We shall see how much different and how improved our beloved Oakland Raiders really are Sunday..